When the Clarence Mitchell Courthouse opened in 1900, the Orphans Court of Baltimore City that went into room number 243 was called the most beautiful courtroom in Maryland. With wainscoting and the judge’s bench made of West Indian mahogany coupled with a gilded ceiling and parquet floors, the room has the atmosphere of an English taproom combined with the delicate embellishment of a French drawing room. The elegant courtroom also almost lost its charm. It fell into disrepair in the 1970s when the orphans court moved out. In 1984, a group of concerned people stepped in to rescue it, raising money for restoration and forming the museum to keep it in good shape. 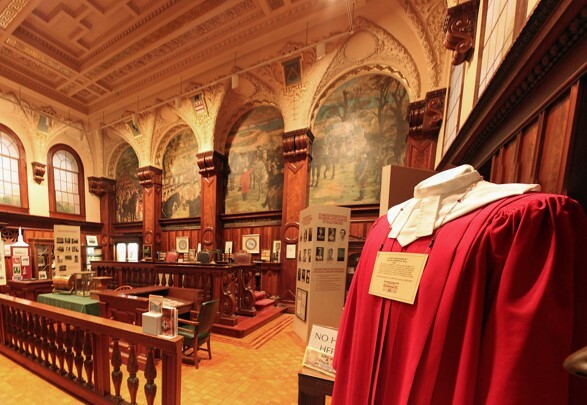 In addition to stunning architecture and design, the room now houses artifacts such as a grandfather clock that was installed in the city’s first orphan court around 1810, a copper drum that was used until the 1960s to randomly select jurors, and the original historic court opinion from 1885 that ruled black lawyers could not be denied the right to practice in the city’s courts. Please join us and our host, Ms. Elva Tillman, for a walk through one of Baltimore’s hidden architectural and historic gems. Our Baltimore Behind the Scenes Tours program has been funded by Mayor Catherine E. Pugh and the Baltimore Office of Promotion and the Arts. Image courtesy of Bill Dunn.